Mr. Buffett elaborates further in a CNBC interview (hat tip to Lauren Foster’s Post). Unconventionally risky. 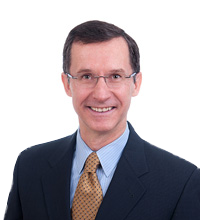 Conventional advice dictates reduced exposure to the inevitable ups and downs of the market. After all, the older we get, the less time we have to recover from market declines. Target Date Funds apply this notion with stock allocations declining over time as seen in the graph below. At twenty years before retirement, stock allocations near 90% as seen on the far left. 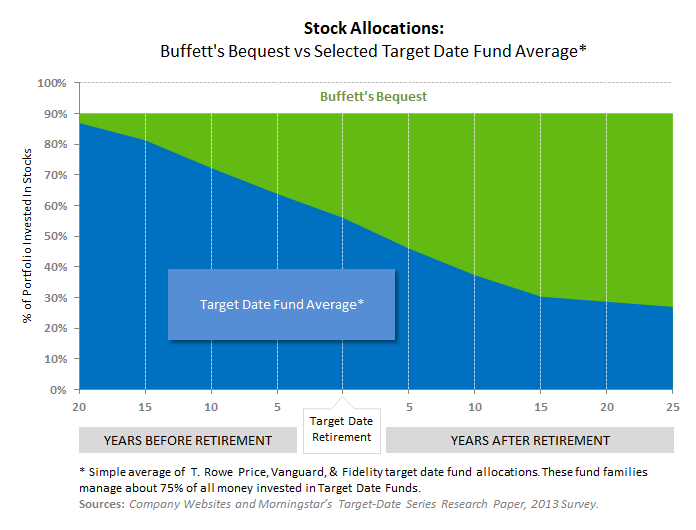 At a “target date” retirement, stock allocations decline to around 55% and fall from there. The growing gap, in green, has important implications. Not for the timid. Mr. Buffett’s advice promises to be a wild ride. Its range of annual returns illustrate deep, potentially stomach-losing drops compared to more conventional allocations for those nearing retirement in the middle and deeper into retirement on the right in the graph below. The expected payoff for Buffett’s riskier portfolio comes in the form of higher expected returns over the long-run. 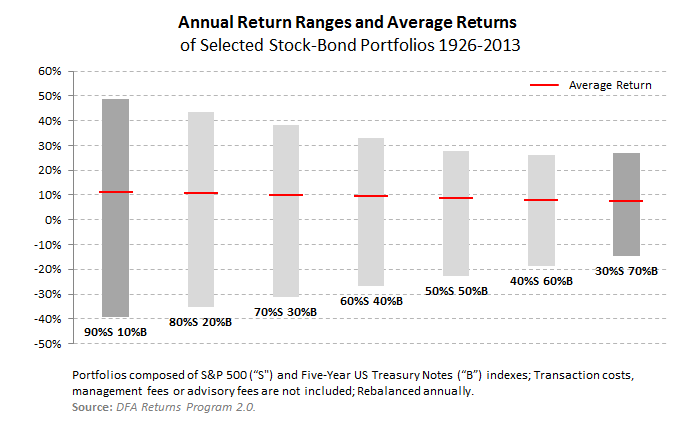 As illustrated below, the 90% stock allocation portfolio had an average return of 11.4% over the past 88 years, as indicated by the red line in the middle of the far-left bar). The same bar also tells us that the same portfolio experienced annual extremes ranging nearly as high as +50% returns and nearly as low as –40%. Compare this to the 7.4% average return for the 30% stock portfolio at the far-right, with annual highs and lows in a smoother range of around +28% to –10%. Wild rides can be trouble. They may translate to selling stocks at low points and then getting back in later, after prices have already climbed and sometimes right before yet another decline. Indicative of such ill-timed entries and exits is the latest Dalbar report, which calculates the average stock investor earned 5.0% over the twenty years ending in 2013 when the S&P 500 returned 9.2%. Over two decades that gap can translate into a large wealth difference. A low withdrawal rate set. Mr. Buffett’s advice to limit withdrawals to 3% or 4% straps you in tight. On a $1 million portfolio, annual withdrawals equate to $30,000 to $40,000. And don’t forget, taxes will likely be due on the withdrawal as either income or capital gains. Note to those nearing long retirements: You may need to save more than you think to retire in the style you want. Stress-testing the ride. A stock market plunge at the beginning of retirement is a threat to portfolios with a high allocation to stocks. In four of the worst ten-year periods since 1926, a $1 million portfolio with Mr. Buffett’s allocation and withdrawals would have dwindled to between $400,000 and $800,000 as illustrated below. These back-tests are hypothetical – they assume historical returns and the availability of low cost index funds for implementation. Such bad scenarios may seem improbable but financial history teaches us they are possible. 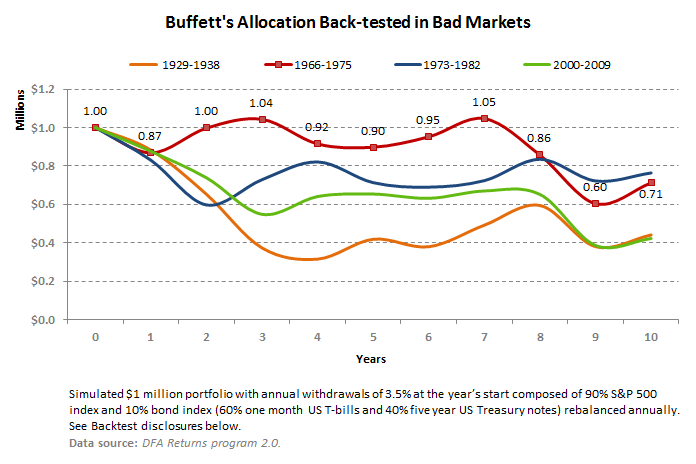 This chart shows the simulated performance of a portfolio starting with an allocation similar to the bequest for Warren Buffett’s wife in four bad time periods. Running out of money. What happens after these ten-year periods may be even more instructive. After the miserable decades of 1929-1938 and 1966-1975 (orange and maroon lines above) these portfolios would have either dwindled to less than $200,000 or completely disappeared over the two ensuing decades if non-essential spending were not reduced. While the 1973-1982 losses (blue line above) were more than restored by the following bull market, increase the initial withdrawal to $40,000 (4%) or reduce each year’s returns by 0.5% to cover higher transactions and/or expenses, and they too would have been depleted within 30 years. As you develop your own investment strategy or seek help in creating one anew, it may help to review it from several angles. How would it endure through harsh periods should they occur? What is your willingness, capacity, and need to take risk, and how should you allocate your portfolio accordingly? That said, every super man must have his Kryptonite. Perhaps Mr. Buffett’s taste for market risks and expected rewards is his. Granite Hill Capital Management, LLC back-tested the performance of a strategy similar to Warren Buffett’s bequest as outlined in his shareholder letter and CNBC interview. The performance is provided for informational purposes. To simulate performance, the back-test maintains target weights of 90% US stocks and 10% short-term US government bonds through annual rebalancing; Mr. Buffett did not mention maintaining such target allocation weights. Withdrawals, which started at $35,000 and grew with inflation, were deducted from beginning of year balances. The back-test uses (1) bond index performance (60% one month US T-bills and 40% five year US Treasury notes rebalanced annually) with a .12% expense ratio deducted to approximate a low cost mutual fund expense and (2) S&P 500 index performance with a .05% expense ratio deducted to approximate the Vanguard fund mutual fund Mr. Buffett chose. Mr. Buffett’s strategy calls for the use of short-term US government bonds, not a mutual fund. The back-tested performance does not represent actual performance and should not be interpreted as an indication of such performance. Back-tested performance differs from actual performance in that the simulation: (1) was not available for investment through most of the back-test time period, (2) would have had higher mutual fund expense ratios during most of the back-test time period, and (3) does not reflect transaction costs in an actual account. This blog entry is distributed for educational purposes and should not be considered investment, financial, or tax advice. Investment decisions should be based on your personal financial situation. 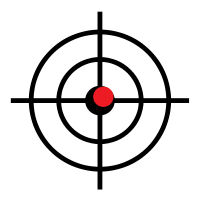 Statements of future expectations, estimates or projections, and other forward-looking statements are based on available information believed to be reliable, but the accuracy of such information cannot be guaranteed. These statements are based on assumptions that may involve known and unknown risks and uncertainties. Past performance is not indicative of future results and no representation is made that the stated results will be replicated. Indexes are not available for direct investment. Their performance does not reflect the expenses associated with the management of an actual portfolio. Copyright © 2014, Granite Hill Capital Management, LLC.